In the aftermath of a massive tornado that killed at least 24 people on the outskirts of Oklahoma City, rescue workers are racing against time to find missing people - some of them children trapped under the rubble of their schools. 18:20 GMT: Two infants were among the 24 people killed by the tornado, said the Oklahoma medical examiner's office. 4-month-old Case Futrell and 7-month-old Sydnee Vargyas died from head injuries. It also raised the death toll of children from nine to ten. The eight other children ranged in age from 4 years old to 9 years old. Of those, six suffocated and two died from massive injuries. Elliott said the agency still is trying to determine the ages of five of the victims. "The ME staff worked throughout the night and yesterday in coordination with state and federal agencies to identify victims and document injuries," medical examiner's spokesman Amy Elliott said in a statement. 18: 18 GMT: President Barack Obama will visit the tornado-ravaged site and meet with victims and first responders on Sunday according to White House spokesman Jay Carney. 18:16 GMT: 12,000 to 13,000 homes were affected by the tornado said Oklahoma City Mayor Mick Cornett. The financial cost of the tornado could exceed $2 billion, because of the size and duration of the storm, according to the Oklahoma Insurance Department. 02:15 GMT: A spokesman for the state Department of Emergency Management has cited 2,400 damaged homes within Oklahoma City and Moore. Some 10,000 people have been directly impacted by the EF-5 tornado on Monday. 01:10 GMT: Moore's community center is seeking donations of flashlights, batteries and lanterns for those residents left without power. There's also a need for tetanus shots, for those who have stepped on nails embedded in debris while working outside. 23:30 GMT: Some 34,000 customers in Oklahoma remained without power on Tuesday evening, according to a report by the state's Department of Emergency Management. 22:50 GMT: Mayor Glenn Lewis said late Tuesday afternoon that "we don't have anybody missing," referring to tornado rescue and recovery efforts in his city. 22:12 GMT: Albert Ashwood, director of the Oklahoma Department of Emergency Management, told reporters on Tuesday that neither of the two schools torn apart by Monday’s EF-5 tornado in Moore, Oklahoma had reinforced tornado shelters. In apparent dispute of that information Moore's mayor, Glenn Lewis said, Briarwood Elementary School had no fatalities as it was a "newer model" of schools and had a "safe room." According to Ashwood, more than 100 schools across the state have such emergency shelters, though it is up to each jurisdiction as to whether limited funding is used for these safe rooms and at which schools. The official added that a shelter would not have necessarily saved more lives at the Plaza Towers Elementary School, where children sought shelter above-ground classrooms. Authorities will review which schools have safe rooms, and try to implement them in additional schools, said Ashwood. 21:31 GMT: NASA has released an animation of imagery from NOAA’s GOES-13 satellite that shows the movement of storm systems in the south central United States on May 20, 2013. 21:15 GMT: National Weather Service has warned that a tornado is expected near Sandisfield and Otis by 5:30 pm EDT. 21:02 GMT: Total insurance claims from the Moore tornado are expected to top $1 billion, an Oklahoma Insurance Department representative told CNN. 20:24 GMT: The path of the “incredibly” powerful 1.3-miles-wide tornado that devastated Oklahoma was 17 miles, said the National Weather Service. The agency’s spokeswoman explained the tornado was upgraded to an EF-5 after a team on the ground made the first assessment of the damage. 20:09 GMT: The US National Weather Service has confirmed that the tornado that hit Moore was a top-of-the-scale Enhanced Fujita Scale EF-5. 19:33 GMT: One day after a tornado touched down in Moore, the National Weather Service has issued a tornado warning for parts of northeast Texas and Arkansas. A severe rain storm rocked Moore earlier in the day, complicating relief efforts being waged by hundreds of rescue orkers. 18:16 GMT: According to a local NBC affiliate, officials say no new survivors have been located so far during Tuesday’s search. During an afternoon press conference, officials in Moore, OK offered an update on the situation on the ground less than a day after a devastating tornado ripped through town. Gov. Mary Fallin remarked that the May 20 twister was “one of the most horrific storms” to ever hit the state, but insisted that the city will be able to pick itself up thanks to expedient rescue efforts already underway. “We will get through this. We will overcome, we will rebuild and we will regain our strength,” the governor said. Fallin said that 237 people have been reported injured, but cautioned, “Frankly, we don’t even know yet if there are missing people” still hoping to be rescued. Craig Fugate, an administrator with the Federal Emergency Management Agency said, “We’re going to keep looking until everybody is found” and encouraged residents of Oklahoma to apply for relief from FEMA. “Those people that have been impacted – go ahead and call,” he said. 17:02 GMT: A rain storm has descended on Moore, complicating relief efforts for rescue workers. 16:49 GMT: Kevin Durant, the 24-year-old star player on the Oklahoma City Thunder professional basketball team, has pledged $1 million to the American Red Cross in order to assist with relief efforts. "The Red Cross relies on its donors to perform its mission in relieving human suffering following disasters," regional CEO Janienne Bella said in a statement. "Mr. Durant's gift and support to Oklahoma comes at a time of great need and we're forever thankful for his generosity." 16:38 GMT: Authorities tell CNN that 101 people were found alive in the rubble so far in the search for survivors. Around 145 have been hospitalized. 15:23 GMT: The number of children killed as a result of the tornado has been upgraded from seven to nine, reports Reuters. The official death count remains at 24. 14:55 GMT: According to CBS News, the mayor of Moore, OK says "thermal imagers" are instrumental in helping emergency workers find survivors underneath the rubble after yesterday’s tornado. 14:46 GMT: Oklahoma Governor Mary Fallin called the tornado “probably the worst I’ve ever seen” in a Tuesday morning interview with CBS. "If you walk through the neighborhoods, if you go through of some of these business areas and certainly when you see the schools, it's just heaps of debris, and you can't really even tell what was in that particular location," she said. "It would be incredible if anybody survived in any of those structures." 14:45 GMT: CNN reports that as many as 250 members of the Oklahoma National Guard are on the ground near the disaster scene to assist with relief efforts. “These guys are equipped with the same kind of gear they have in a war zone,” Pentagon correspondent Barbara Starr said early Tuesday. 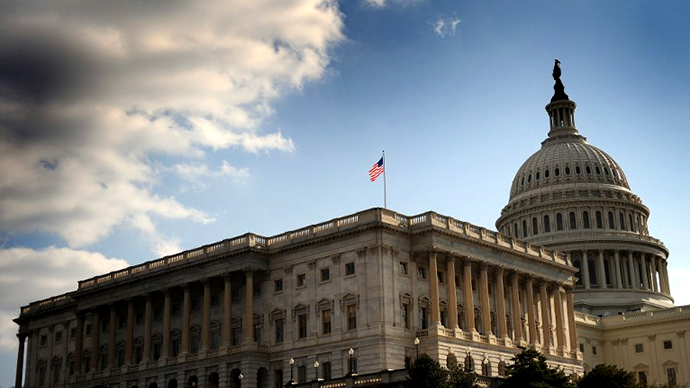 14:24 GMT: The flag above the US Capitol Building in Washington, DC will soon be lowered to half-staff in memory of those who lost their lives in the Oklahoma tornado. “Our prayers are with the people of Oklahoma today,” said Obama, who urged Americans across the country to participate in disaster relief efforts. The president acknowledged that FEMA rescue teams from Texas, Nebraska and Tennessee will all assist with recovery missions in Oklahoma, and pleaded with others to pray for the victims and assist in any way possible. “As a nation, our full focus right now is on the urgent work of rescue,” said the president. 13:42 GMT: Seven children are among the 24 people confirmed dead. Original figures said around 20 children had been killed. 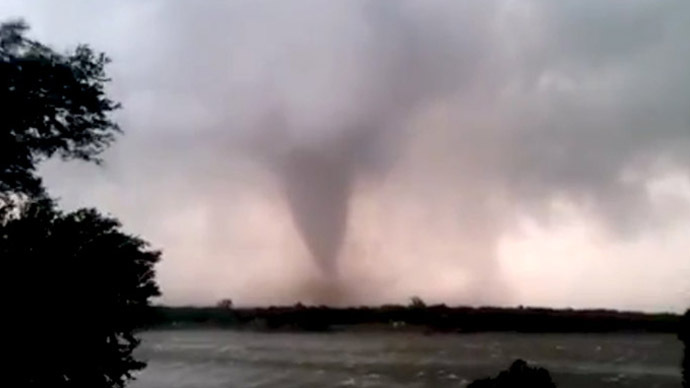 13:10 GMT: Officials say that 24 bodies have been confirmed dead from the tornado. Original figures put the official death toll at 51. 12:40 GMT: The Federal Emergency Management Agency has laid out the funding available for individuals and areas affected by the tornado. "Assistance can include grants for temporary housing and home repairs, low-cost loans to cover uninsured property losses, and other programs to help individuals and business owners recover from the effects of the disaster. Federal funding is also availble to state, tribal, and eligible local governments and certain private nonprofit organizations on a cost-sharing basis for emergency work in Cleveland, Lincoln, McClain, Oklahoma, and Pottawatomie counties," the statement reads. 12:32 GMT: Authorities have ordered all media to leave the area where they are searching for survivors because rescuers are having trouble hearing victims calling for help, according to a CNN correspondent. 12:30 GMT: The Draper water treatment plant in Oklahoma City still has no power, according to the state government. Authorities have asked people in Oklahoma City to turn off all outdoor water use to allow water to be delivered to affected areas. 11:57 GMT: 101 people have been rescued from the rubble thus far, authorities told NBC news affiliate KFOR. 11:39 GMT: White House announced President Barack Obama will deliver a statement on the Oklahoma tornado at 10 a.m. (1400 GMT) Tuesday. 8:45 GMT: A severe thunderstorm warning was issued for the area near Purcell, a city some 40 km south of Moore. If you are looking for a lost relative from today's tornado, go to safeandwell.org. 7:55 GMT: Rescuers have warned Moore residents that returning to the devastated area is hazardous – there is a lot of debris and mud covering the earth, making it dangerous to walk on. There is also strong smell of natural gas in some spots, indicating risks of possible fires or explosions. 7:48 GMT: Debris from the Monday tornado was reportedly found as far away as 450km. 7:41 GMT: A large plume of smoke or dust was spotted rising over the demolished Tower Plaza Elementary School, where rescuers continue recovery operations, reports KFOR. 7:23 GMT: About half of the 40 additional deceased that Oklahoma medical examiners are expecting are children, according to the office. Added to the previous count, some 40 children are among the total 91 victims confirmed so far. 6:33 GMT: The National Guard has been deployed in the disaster area to ensure that first responders can work uninterrupted, and to prevent looting. 6:19 GMT: Oklahoma Governor Mary Fallin says additional damage assessments are ongoing, as more counties may be designated for emergency federal aid beyond the five already announced. 6:10 GMT: A severe storm watch has been issued for the Midwest, including Oklahoma, until at least Tuesday morning. Hail as large as a quarter is possible. 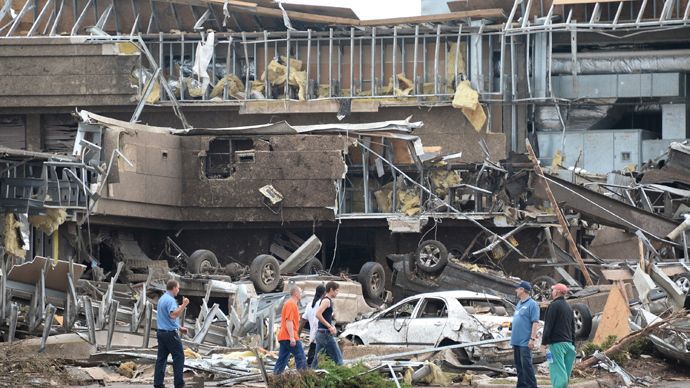 5:30 GMT: Active search for bodies called off for the night at Plaza Towers elementary school in Moore, OK, where at least 20 children lost their lives after parts of the school collapsed. 5:10 GMT: Intellicast.com weather forecasting warned of additional storms developing on Tuesday including the Oklahoma City and Moore areas. Some of these storms may be severe. 4:54 GMT:State Medical Examiner’s Offices puts death toll of Monday's tornado at 91. 4:46 GMT: Golf ball-sized hail was reported east of Coryell, Texas, and near Little City, Oklahoma. 4:45 GMT:It is feared more tornadoes will hit Oklahoma on Tuesday, some of which may be large and destructive. 4:33 GMT: People separated from their families by the tornado are calling on the public to help them reunite. 4:03 GMT: Twenty four children remain unaccounted for after the devastating Oklahoma tornado, CNN reports. 4:25 GMT: Repair crews are working to restore running water to the devastated city of Moore. 3:59 GMT: All public schools in Moore, Oklahoma will remain closed on Tuesday. 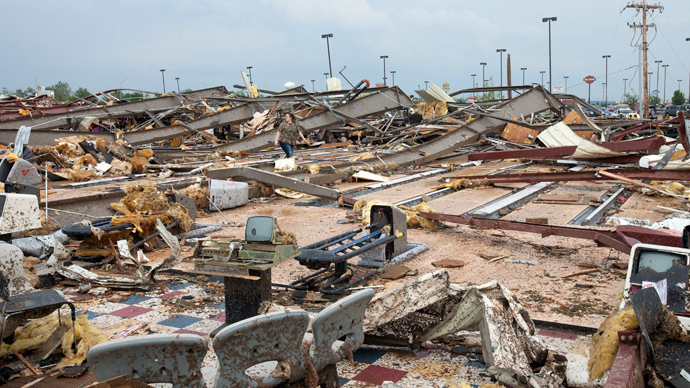 3:54 GMT: Officials at two Oklahoma hospitals have revised the number of patients they have been treating. Since a massive tornado hit suburban Oklahoma City a total of 120 patients, including about 50 children, were admitted to hospitals, officials said. 3:43 GMT: US President Obama has signed a major disaster declaration following a devastating tornado in Oklahoma, making federal funding available in Cleveland, Lincoln, McClain, Oklahoma and Pottawatomie. 3:17 GMT: Some of Oklahoma children earlier reported as missing have been found in local churches, CNN reports. 2:45 GMT: As of 9:45 pm central time Oklahoma medical examiner’s office has confirmed 51 deaths and 233 injuries. 2:35 GMT: Medical examiner's office says that at least 20 children were among those 51 confirmed dead after Oklahoma tornado. 2:23 GMT: Two Oklahoma hospitals are treating more than 140 people, including about 70 kids, after massive tornado hit Oklahoma.